The method of construction—specifically, how the stem was formed—is unprecedented in glassblowing history, and a similar technique was not reinvented until the 20th century in Venice. The St. Augustine Rouen Goblet shows the use of an oven (called a pick-up box, or a top-loading annealing oven) to keep the cup hot while the foot is being formed. When the original object was made, another worker probably kept the cup hot while it was still attached to its punty. Verre des Augustins. France, late 14th century. H. 17.8 cm. Musée Départemental des Antiquités, Rouen (1959.4-14.1). Photo: Musée Départemental des Antiquités, Rouen (cg76); © Yohann Deslandes. A bowl with metal handles, perhaps the most widely published example of Byzantine glass, is generally agreed to have been made in Constantinople during the 10th or 11th century (Fig. 12). It is made of dark wine-red glass, and it is decorated with enameling, gilding, and luster staining. The bowl is housed in the Treasury of the Cathedral of San Marco in Venice, and it is believed to be part of the booty brought back to the West after the Crusaders’ sack of Constantinople in 1204. San Marco Bowl, gilded, enameled. Byzantine, probably 10th century. H. 17 cm, D. 17 cm. Treasury of San Marco, Venice (109). Photo: Cameraphoto Arte, Venice / Art Resource, NY. 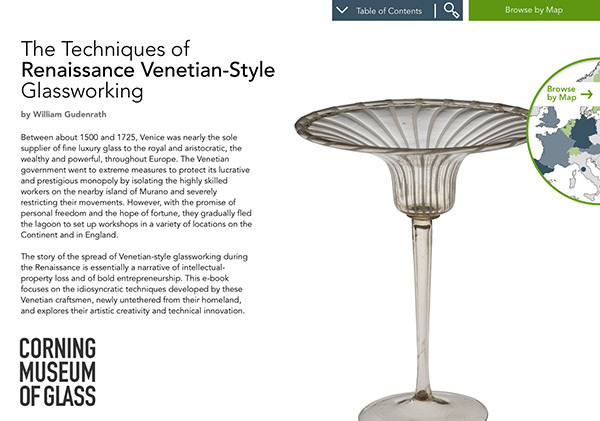 As was noted above, questions about the means by which enameling (and gilding) came to Murano are part of ongoing inquiries into the history of Venetian glass. These two techniques were being practiced with great sophistication in Syria (Aleppo?) and Egypt in the 13th and 14th centuries. It is entirely possible that, because of trade or the Crusades, both objects and expertise (in the form of transplanted workers) found their way to Murano. The Palmer Cup, gilded, enameled. Islamic, possibly Syria or Egypt, early 12th century. H. 26.3 cm; D. (rim) 13.2 cm, (base) 12 cm. The British Museum, London (WB.53). Photo: © The Trustees of The British Museum (WB.53AN1501269001).